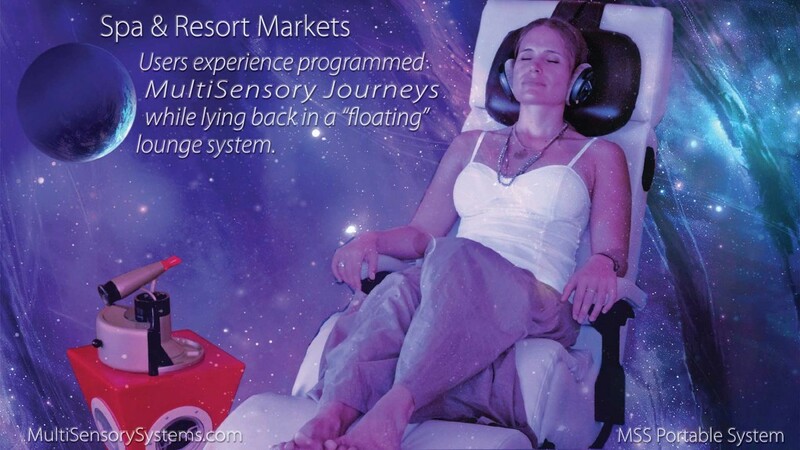 MultiSensory Systems has patented systems and methodology that provide inspirational and transformative experiences integrating mood-enhancing aromas from custom-blended essential oils, three-dimensional sound, vibration, and optional visual imagery. Multisensory ‘Journeys’ can be custom-designed to work as a signature experience that fits your spa location and themes, and complement existing treatments. Journeys can be promoted as the highlight of a combined spa services package, or ordered a la carte – and priced accordingly. This Multisensory experience goes far beyond normal product bundling… this is a dramatic presentation of traditional Spa services; an amenity that will greatly enhance a guest’s satisfaction level. This innovative technology provides a memorable experience connected with the Particular Spa & Resort. This “High Tech” and extremely “High Touch” system will bring continued attention and publicity, enhancing the Spa’s image and helping it become and helping it become the Spa of choice over the competition. The MultiSensory Experience is a great marketing tool, a promotional wonder that attracts new customers and provides others with a new reason to return. Increases Customer Base: Expands the reach of the Spa; attracts those customers who may not usually use Spa services, and brings in others looking for a unique new experience. Something for Everyone: Journeys are designed to attract specific types of resort customers; a variety of software Journeys are available for various market segments, such as younger, tech-savvy college students, romantic couples or seniors seeking adventure. Low cost, low investment, high return: MSS is offering a revenue-sharing plan with Spas & Resorts that requires low-to-no cash outlay upfront. Invitation: MSS would like to give you the opportunity to be among the first to make use of MSS technology. If the mock article below has peaked your interest, please contact us for further information on the MSS Pilot Program and to arrange a demonstration. Below is a theoretical example of a magazine article highlighting “MultiSensory Journeying” within a particular Spa & Resort setting. This mock magazine article describes Journeying as could be implemented at the Ojai Valley Inn & Spa, as an example. Please enjoy the read, and imagine what this could do for your business.